Whether you're heading out for a hike or taking a road trip, it's nice to know you can relax and enjoy the journey because you've packed your comfort kit for first aid. Have you ever been in the woods or away from home when you thought "I sure wish I had my natural remedies with me." And, having a kit along can give you a certain satisfaction of being more self-sufficient too. 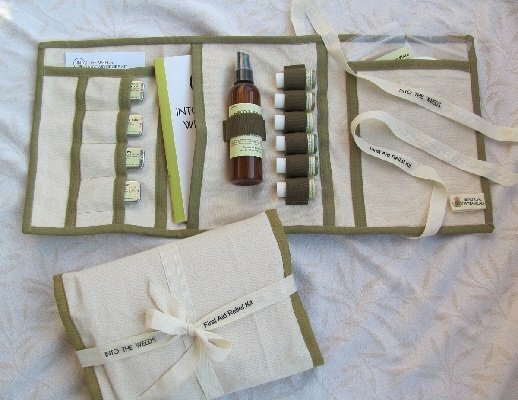 The Into The Weeds First Aid Relief Kit is made of durable canvas with military weight elastic that secures the many herbal products offered in this convenient pack. The kit comes with 14 items to address many common conditions that will help avoid an abrupt ending to your outing. The 16 page "Into The Weeds First Aid Relief Booklet" comes with this kit as a reference guide for the kit products as well as the additional kit products available from Beneficial Botanicals. Kit Size / Three Panels Folded & Tied: 7" x 10" x 1" to 1-1/2"
Kit Size / Open: 21" x 10"
Kit Weight / Packed: 1 lb. 1 "Into the Weeds First Aid Relief Booklet"
6 Bottles .2 dry oz / .33 fl oz. Into The Weeds First Aid Relief Kit has 2 large vertical pockets, 1 side pocket (in the middle panel), 4 tin slots, 1 pocket for a pair of tweezers or small folding scissors, and 7 elastic hold downs. Twill ribbon closure ties the kit up into a neat package, making it an appealing gift for the avid hiker, herbalist, geocacher, camper or traveler.